Duke’s staff of nursing and health care professionals is among the most talented, dedicated, and passionate in the industry today. Duke Nursing strives to empower nurses to become truly exceptional, encouraging staff to take advantage of the educational tools and opportunities of a lifetime that Duke University Health System has to offer. Programs such as the BSN2020 Initiative, Clinical Ladder, and float pool positions support nursing staff needs for continued engagement and growth within the organization. Nurses are able to exercise their interests in leadership roles within their unit through programs such as the Charge Nurse Program and the Nurse Preceptor Program. Interested nurses participate in formalized training that will assess and validate required nursing skills. Following successful program completion, charge nurses and nurse preceptors are immediately able to assume leadership responsibilities and receive compensation incentives for doing so. Staff members can take classes at Duke University after only one year of service. The Duke Educational Services Department is available for staff to enroll in continuing education courses in a variety of areas. The Registered Nurse Tuition Assistance Program (RNTAP) provides up to 90 percent of funding in conjunction with the Duke Employee Tuition Assistance Program towards a Nursing Master’s degree, post-Master’s degree certificate, and Doctorate of Nursing Practice (DNP) degree at the Duke University School of Nursing. Educational paid-time off is available for up to 40 hours per year for full-time employees. Technology Education Services offers opportunities for nurses to learn the latest technology and software utilized by the health system in reporting and assessment tools. The Friends of Nursing program provides educational scholarships to outstanding nurses, to support educational goals and supplement travel expenses associated with research-related presentations. The Friends of Nursing Martha White Blalock Nurse Scholar’s program sponsors lectures by nationally renowned nurse scholars and clinicians presented on Duke Health University System campuses. 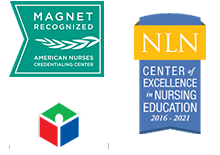 The program no only supports the recognition of nursing successes, but also provides a financial network for professional development to improve patient care. FON sponsors seminars and educational programs, funds scholarships for nursing education, financially supports learning and research dissemination, and recognizes outstanding nursing practice. These initiatives ensure that all DUHS nurses have access to the funding and education required to enhance their roles as health care providers, educators, researchers and administrators. Over the years, FON has grown through the generosity of numerous individuals and corporations. As of 2016, FON included 19 endowments to support nurses in a myriad ways, including 36 awards for nursing excellence that are presented at the annual FON Gala.